Dr. Crawford Lorritts Jr.’s father was dying. 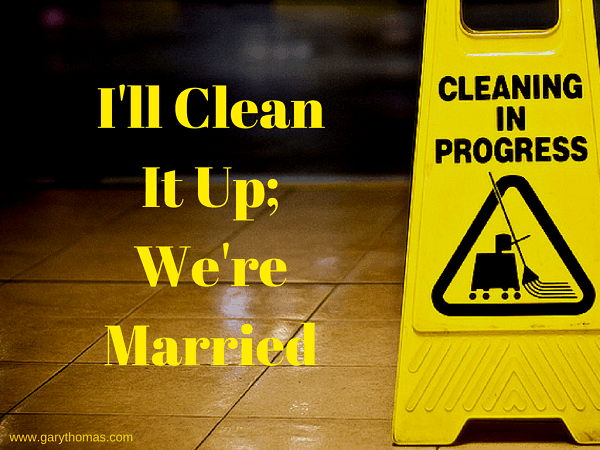 That line, “I’ll clean it up, we’re married” is at the heart of a sacred marriage. In 1978, Charlie Wedemeyer was diagnosed with ALS and given one year to live. While he survived an astonishing 32 years past that initial diagnosis, the disease left him with many humiliating moments, such as the time some friends stopped by to visit and it took Charlie and his wife an hour to take him to the bathroom. What does your spouse have right now? An addiction? An overwhelming insecurity or lack of shame? Severe employment restrictions? Psychological breakdowns—depression, and the like? Physical ailments? I know they say one shouldn’t spend too much time talking or discussing life and marital issues with someone of the opposite if you are married but I could use your wisdom so much. First marriage failed. She left, moved out of state and left our son then 5 with me. Was a single dad for a few years then found a wonderful woman that didn’t mind my baggage. We got married and now have 3 kids under age 3 which makes our total 4. However, lately there has been too many contentions, arguments, yelling, etc. I don’t trust her anymore because I found she gossips about everything that goes on in our home and marriage to her friends and family to make me look bad. I’m somewhat private. I prefer certain matters to stay within our home. Lately, I have been seeing too many red flags i.e things that repeated in my last marriage that eventually killed it. I’m so fearful right now. She’s younger and does not understand the seriousness of divorce and the vitality of caring for your marriage. At times I feel like leaving to save myself another heartache before she does something foolish. She is naive and so not street smart I’m worried about her. HATE cannot describe how I feel about divorce. My son and I still suffer from the effects of the last failed marriage. Too many disagreements, no team work, no togetherness, no consistent prayer time/devotion, no interests in pursuing change. Please share some insights. I TRULY want this one to work out. Maybe I’m still traumatized but it’s been 10 years since the divorce. HELP PLZ. Sometimes the LORD calms the storm and sometimes the LORD calms His child. Our role as Christ-followers is to simply love. We must leave the rest (the fixing, changing, etc) to Him, for He is able to do far more than we can ask or imagine. He is a mighty fortress! I hear you! I have been you! Twenty-two years ago, I walked down the aisle to the man I thought was my Prince Charming. I thought my life would be “happily ever after” from that point on. We were in church, and we prayed, and we acknowledged God. We made a covenant agreement of “Til Death Do We Part.” I shamefully admit that after that day, God was not the center of our marriage. I knew better but I thought that when we had a family, things would get better. We would start going to church. I looked the other way when he had a few drinks as he closed down the restaurant he ran. I ignored the times I had to go pick him up at 2:00 am because the few had turned into several. Two years later, as we were rushing to the hospital, with me in pre-mature labor, he promised never to drink again. He would not be the alcoholic father his dad had been. Our daughter was born full-term and he kept that promise. No more drinks. Unfortunately, the drinks were replaced with pills. A pulled back here got him one pain pill, a fused disc in the neck got him a multitude of pain pills. Then there were the migraines caused by trying not to take the pills. And on and on it went. All of the drugs, though prescribed and legal they were drugs, took their toll on his stomach and he eventually had several surgeries. The last one was almost 8 years ago. After that, he spiraled down. He became a crazed hypochondriac finding any reason to go to another doctor that would write a script. He lost his job and began to have panic attacks. They gave him anti-anxiety pills. He then went to bed and there he stayed for 7 years! If he was awake he was either raging angry, trying to get to another doctor or so drugged we did not know what he was going to do or say next. It was nothing to wake up in the middle of the night to smoke where he had gone down to cook something and passed out with food on the stove. He often messed himself in the bed in his sleep. He slept through the loss of our house to foreclosure, the death of my father, our daughter’s high school years, and many other life events. I look back now, with my 20/20 vision and I see all the signs that were there even before we married. Signs of depression, impulsive behavior, mood swings and I remember joking with girlfriends that he was bi-polar acting. Things were not right from the beginning. I hopped in and out of church through the years. I knew how important it was for our daughter to be raised in church. I was a Christian but at some point, I had become angry with God. I wanted Him to make all of this mess right but I also felt a need to fix it all myself and I thought somehow I could save Michael. After Michael’s last surgery, when he caved in on himself emotionally, other’s began to catch glimpses of what was happening in our home. I had spent the majority of my marriage hiding it. See if I admitted that I had married him knowing that he was not a Christian, then I would have to admit that I too had sinned. Well intentioned people would tell me that they did not know how I did it. They would say things like, “No one would blame you if you left”, or “God wants you to be happy,” or “He hasn’t honored his marriage commitment so you aren’t bound by yours.” Through all of this, I would beg God to release me from the hell I was in. When he would go in the bathroom and cry because he had soiled the bed in his sleep and I was up changing the sheets at 3:00 in the morning, I would ask God if this was really what I was supposed to be doing. I wanted out but I stayed because there were three of us at that alter on our wedding day. My covenant was not just with my husband but with my Lord also. He loved me and He loved my husband. Through all of this, I would pray, “Father, my Papa, please oh please save him. Why won’t You show me how to save him? If you aren’t going to save him then please let me go,” and almost audibly, every time He said, “NO! It isn’t time yet.” See, I was trying to control everything myself. I wasn’t just cleaning it up, I was trying to keep it from happening. I was trying to be the cure, when all God wanted me to do was keep the promise I made not only to my husband but also to Him. Eight months ago, my husband finally broke and went into a detox facility. I thought this is it! Then he came out and because of the types of drugs he had been on, he continued to detox at home. He had seizures and crazy manic episodes for over a week. For 3 nights I stayed awake and watched a complete spiritual warfare take place in our bedroom as Satin tried to keep my husband. I have not been to hell but I have stood at the entrance and seen how horrible it is. Finally we found an inpatient facility 3.5 hours from our house that would take my husband and I begged his parents to help pay for it since his insurance would cover nothing. That trip took us 5 hours because we had to stop every little bit for him to calm down. After 30 days I picked up a man who, for the first time in our marriage, wanted to know God. While he was away, an acquaintance from my teen years, contacted me and said that he felt led to befriend my husband and to counsel him and teach him about Jesus. At the second meeting, my husband finally gave up all his baggage and submitted to Christ. When I say that there was a miraculous transformation, I am not exaggerating. My husband tells everyone that he got sober, got saved and got healthy. He reads the Bible every single day. We have a daily devotional and we pray together every night! I share this not because I am or ever was strong. I was actually very weak. I do however serve a strong God. If I had left, and broken that covenant between the 3 of us, if I had listened to people and not the conviction the Lord placed on my heart, I would NEVER have been privileged enough to witness the miracle that God performed in my husbands life. Stay strong in your promise and listen to what God is telling you. You’re living an amazing legacy. Bless you Dawn. Dawn, It’s rare that I comment online but I want you to know that God has used you to inspire me tonight. I love when you say stay strong in your promise and listen to God. Your testimony is amazing!! Thank you all for your wonderful encouraging words. Jeanne you know your scripture and use it well. After living with active alcoholism for 30+ years my husband has been sober for 2-1/2 years now. God is so good. Our relationship is great and God has turned the heart of one of our daughters back to her father. Thank you, Jesus-you make all things new! Praising the Lord with you, Sandra!! accept one another, encourage one another….start living out His Word one minute at a time. Choose one fruit of the Spirit each day and tell yourself, “Just for today, I am going to be loving.” (or kind, gentle, patience, in control of my own emotions/actions, peaceful, joyful, etc). Then you focus on YOUR actions and YOUR behavior, not his. You treat him with kindness, respect and love regardless of how he treats you. Learn to say, “I’m sorry” for whatever he is upset with you about, even though you may only be 1% wrong and he is 99% wrong. Watch your tone of voice and check your own heart’s attitude. You will have to learn to love the unlovable. Don’t point out his flaws to him, but love him in spite of them. Find something you can praise him about every day such as “Thank you for going to work today, Honey. I really appreciate the work you do.” or “I’m really glad you came straight home from work today. I have missed you!” There is treasure buried deep inside him and you have to dig it out. I’ve lost the life I wanted, but found out that God had something better for me. Like our pastor preached today, your prayers should be “Teach me”, “what’s next” and “change me”. Then sit back and watch God perform miracles in your life! I’ve asked for Him to perform a miracle in our marriage and He did. But….He did so by changing ME, not by changing my husband! It is not an easy road, but it is worth it. Trust Him and obey Him. There is no other way. God bless you, my dear sister. May the LORD strengthen you in your inner being and give you just enough LIGHT to see your next step. Except when “I”ll clean it up” becomes codependant enabling. For so long I thought that was love, I’m still trying to figure out the difference. I wish the church would teach more about this. Of course, both wives in these stories are dealing with medical issues, not addictions, so nothing codependent is going on. I’ve addressed addictive and destructive behavior before. Here, I wanted to showcase and celebrate those who face natural challenges and rise like heroes to stay true to their vows. I wish this surrendering would work for me. My spouse has mental health issues, i.e., depression, may be bipolar, for which he refuses to acknowledge and will not seek help. Small things set him off into the point of rage, he is verbally abusive, and has on several occasions, become physically abusive. Unfortunately, this is not acceptable behavior. Any advice? I am dealing with the exact same issue with my husband. It’s a tremendous challenge to know how to appropriately respond to the illogical remarks and the manic behaviors. Fast forward to 2011….my husband in deep depression – something he had struggled with for most of his life was put on a medication that changed him in the worse way. He lost his job, we lost our church family and friends, we lost biological family members who wanted nothing to do with the ‘crazy’ person. He lost his love for me and treated me with complete harshness. He was out of control on every level – spending, medication, spiritually, emotionally, physically, etc. After an intense argument which had become the norm for us because it is impossible to reason with an individual with a chemical imbalance in their brain, I left him a note on the bathroom mirror in 2014 that stated, “I would rather have you like you are than to not have you at all”. That was my day of surrender. I quit trying to change him or fix him. I accepted him just as he was. Fortunately, another medication has been added to his regimen which has calmed him down and the aggressive rages have diminished to almost none at all. It is now 2015. He is on Disability and has never returned to work and never will. I have returned to work and I am picking up the pieces as best as I can. We are in our 50s and life is not the way I had planned it to be. I’ve surrender that as well. My purpose is to love and serve my God by loving and serving my husband. I care for him with joy – regardless of what he does or doesn’t do, regardless of what others think, regardless of his embarrassing behavior at times. He is my gift and my priority. It doesn’t matter what diagnosis he has been given, what labels have been attached to his name, what mental state he is in. He is made in the image of God, he is my husband and my brother in Christ and WE ARE MARRIED. Your words ring true, Gary. My life is your two paragraphs, the last nine sentences……..every one of them.